Pilates Band Exercise: Stretch and Tone! 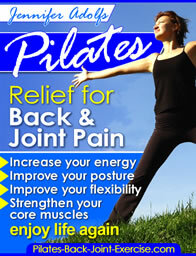 Doing Pilates band exercise is a great way to stretch and tone muscles. Since I have incorporated the bands into my traditional classes many students noticed the benefits right away. Check out my new morning workout with the Pilates Stretch Band below for healthy back and shoulders. What type of Pilates Exercise Band Should You Use? The best way to do your Pilates band exercise is with a piece of wide rubber band type material. The tensions vary depending on the color. Generally a lighter color such as yellow is lighter tension and a darker color like blue or black means more tension. I generally use a medium tension band such as a green color when I introduce it to my students. You can tie handles onto the band to make it easier to handle. Position - Lying on your back with one leg extended on the mat. Hook the band around one foot and extend the leg straight up until you feel a stretch in the back of the leg. Movement - Keeping the pelvis and opposite leg stable and anchored to the mat circle the leg with the band around in the hip socket 6 times each direction. Inhale as you begin the circle and exhale as you bring the leg back to center. Switch legs and repeat. Cues: Keep the body still and feel the top of the thigh bone (femur) circle in the hip socket feeling the stretch in the thighs and work in the pelvis to stabilize. See more of these band exercises in my newly revised shoulder exercise ebook here. Position - Sitting up tall on your mat with legs extended (bend your knees slightly if you are slouching or rounding your back) and band hooked around your feet. Movement - With one hand on each end of the Pilates band pull towards your chest. Or, you may also pull the band to your waist drawing your elbows straight back like you are trying to elbow someone behind you. Exhale as you pull tightening your abdominal muscles; inhale as you extend your arms reaching towards your toes. Repeat for 8 –10 repetitions. Position: Lying on your back with your Pilates exercise band wrapped around your feet and holding the ends in each hand. Movement: Using as much band tension as you need slowing roll the spine up until you are sitting up. Peel the spine from your head to your tail using the abdominal muscles to control the movement. This Pilates roll up exercise feels great and really helps to keep the spine limber while lubricating the vertebral discs. Inhale as you curl the head first and then exhale to pull the abs in deeper to peel the rest of the spine using the band tension to help you roll up. Roll back down again peeling the spine and repeat for 6-8 repetitions. Position – Sitting up balanced on your tailbone with your knees pulled up into your chest and the band wrapped around your feet. Movement – Tension your Pilates exercise band and draw the abs in to initiate the roll back to the shoulder blades then roll back up to a balanced position on the tailbone. Cues – Exhale as you roll back inhale to come back up. Keep your head still, eyes on your belly as you roll so not to throw your head back. Position – Lying on your back with knees bent or legs extended, holding the band shoulder width reaching to the ceiling above your chest. 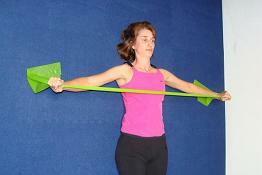 Movement – Exhale as you draw the shoulder blades together pulling the exercise band across your chest. Arms reach wide out to the sides of your chest. Inhale as you reach the arms back up controlling the tension of the band. Cues – Feel the shoulder blades doing the work, drawing together as you pull and apart as you reach back up to the ceiling. Incorporate your Pilates band exercise into some of the many exercises found here in the Pilates Ebook full of back and joint healthy exercises.